ERNEST J. LANZILLO, [Note 1] MARILYN R. LANZILLO, DONNA M. REGIS and ROBERT J. McGEE vs. CATHERINE S. ZACCONE, Individually and as Trustee. The plaintiffs, Marilyn R. Lanzillo, Donna M. Regis and Robert J. McGee, as owners of land abutting on Velma Road, a private way in Wakefield in the County of Middlesex, bring this complaint pursuant to the provision of G.L. c. 231A against another abutter, Catherine S. Zaccone, individually and as trustee, for a declaratory judgment as to the rights of the parties in said private way. The plaintiffs admit that the defendant has the right to pass and repass over the existing traveled way, but they deny that the defendant has the right to improve the way and to remove therefrom stone walls, trees and other encroachments within the way as it appears on recorded plans. The defendant seeks to construct the way to its full width as it appears from records in the Registry of Deeds so that she may sell the three lots owned by her and shown on a plan entitled "Subdivision of Land in Wakefield Mass. for J. William Burke" dated May 12, 1951 by Dana F. Perkins and Sons, Inc. and recorded with Middlesex Soth District Registry of Deeds (to which Registry all recoring refrences herein refer) as Plan No. 1152 of 1953 in Book 8097, Page 212. For ease of understanding the latter plan has been attached as Appendix A to this decision. The plaintiff Marilyn R. Lanzillo owns Lot A thereon; the defendant either individually or as trustee owns Lots B, C and D, and the remaining two plaintiffs own Lots E, F and G.
1. In 1951, J. William Burke ("Burke") with his wife, Velma I. Burke ("Mrs. Burke"), owned a tract of land (with buildings) in Wakefield, Massachusetts. The tract is located on Prospect Street and as owned by the Burkes contained approximately 161,000 square feet. The above described premises are conveyed together with the right to use the passageway as shown on said plan, in common with others entitled thereto, until such time as the grantors lay out or relocate a way in substantially the same location, at which time the grantors covenant and agree to grant an easement to the grantee for the use of said way by the grantee, her heirs and assigns, in common with others entitled thereto. 3. Also in 1951, by plan dated May 12, 1951 (Exhibit 3), Burke subdivided the entire tract into seven lots, Lots A through G. The locus, "Velma Road," is shown on said plan. Subject to and with the benefit of an easement in Velma Road, for the purpose for which streets or ways may now or hereafter be used in the Town of Wakefield, Massachusetts. . . No other building or structure shall be erected on said Lots B, C, and D costing less than $18,000.00 exclusive of the cost of the land. The said deed to Zaccone is not further limited or restricted. 5. Through mesne conveyances, Defendant is now title-holder to the land conveyed by Burke to Guy Zaccone. 6. Velma Road is the only means of vehicle access to the land owned by the Defendant and shown as Lots B, C, and D. The Defendant, her family members and invitees have used Velma Road on a year-round basis to gain access to Lots B, C, and D.	Their activities on Velma Road and on those lots have included, among other things: planning for and surveying the property for development, use of a summer house and tennis court located on the land, and maintenance of the area. 7. The house where Defendant resides fronts on Morningside Road, a public street in Wakefield. This residential lot, along its back line, abuts Lot D and part of Lot C, as shown on Exhibit 3. NORTHEASTERLY EASTERLY and SOUTHEASTERLY by Velma Road in several courses; Four hundred thirty-nine and 11/100 (439.11) feet. . . There is granted to the above noted premises the right to use Velma Road throughout its entire length as shown on said plan for all purposes for which streets and ways are commonly used in the Town of Wakefield. Subject to easements and restrictions of record insofar as the same are now in force and applicable. 9. When Burke conveyed Lots E, F and G to the Radvilles, the conveyance included all of the then remaining lots owned by Burke and shown on Exhibit 3. 10. In 1972 the Lanzillo Plaintiffs became the successors in title to Jones, as to the land conveyed by Burke to Jones in 1951. 11. In 1984 the McGee/Regis Plaintiffs became the successors in title to the Radvilles, as to the land purchased from Burke in 1960. 12. The deeds held by the Plaintiffs contain no other easement by grant or reservation pertinent to this action. 13. Velma Road, as it is shown on Exhibit 3, is 40 feet wide throughout its length and is approximately 400 feet long. The northern third has been paved and most of the southern two-thirds has been gravelled to about 15 feet in width throughout. The paved and gravelled portions of Velma Road have been used for motor vehicle travel. Driveways branch off to the Lanzillo house and to the McGee/Regis house. The rest of the locus is occupied by grass, vegetation and a few trees. At the north end of the locus, a pair of walls about 3 feet high and 1.7 feet wide, parallel to Prospect Street, intercept the locus and leave an opening 15-16 feet wide, through which the paved portion of Velma Road passes. The Definitive Plan and Profile of Velma Road, dated April 1, 1987 (Exhibit 6) accurately depicts the locus. 14. The photograph annexed as Exhibit 7 shows the locus as viewed from Prospect Street. The photographs annexed as Exhibits 8 and 9 show the locus as viewed from Lot C and Lot B, respectively, the tree lines marking the 40 foot boundary of the right of way. 15. The plan dated August 25, 1989, by John R. Snelling, annexed as Exhibit 10, accurately shows Velma Road in relation to its present physical state. 16. The present physical state of the locus and its immediate surroundings has continued essentially unchanged since 1953, apart from maintenance of the area. No trees, shrubs, or other natural objects have been planted in the locus. Defendant, and her predecessor in title, have, over the years, on occasion plowed the entire length of Velma Road during the winter months. No	reconstruction, addition	or modification to any structure or object within the locus has occurred since 1953. In addition, items have not been stored within the confines of the locus. 17. Plaintiffs have never attempted to deny Defendant, or her predecessor in title, passage over Velma Road - either temporarily or permanently - nor have they ever erected any gate or other permanent or temporary structure on any portion of the locus. For all times relevant to this action, Velma Road has remained passable for motor vehicle traffic. The Plaintiffs, individually or collectively, have never claimed title to the whole of Velma Road, nor have they objected to the Defendant's (or her predecessor's) presence on the locus nor have they attempted to eject her or her predecessor. 18. 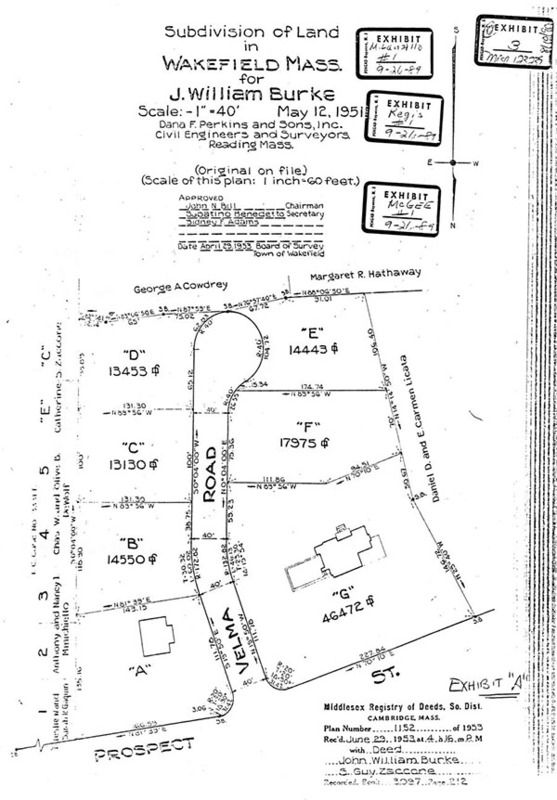 Defendant's predecessor in title obtained Town of Wakefield Board of Survey approval of a plan to construct Velma Road. The approved plan is attached as Exhibit 6. 19. In 1962, A. M. Gregorio & Sons, Inc. was involved in a construction project for the Town of Wakefield on North Emerson Street, which intersects with Prospect Street near the locus. Defendant's predecessor in title engaged A. M. Gregorio & Sons, Inc. to begin construction of Velma Road while their workmen were in that area. In that connection, Defendant's predecessor in title, together with A. M. Gregorio & Sons, Inc., traversed the entire length and width of Velma Road, gathering information preparatory to construction of the road. A. M. Gregorio & Sons, Inc.completed a survey of the side lines of Velma Road, starting at its intersection with Prospect Street. That survey established the side lines of the road, after which A. M. Gregorio & Sons, Inc. sent a rubber tire backhoe/front end loader with an operator, along with a laborer, a dump truck and brush clearing equipment to provide site preparation for ultimate road construction. Some site clearing was performed within Velma Road. 20. Defendants would testify, and Plaintiffs have no contrary evidence, that Defendant and Defendant's predecessor in title have, at all times, believed that they have a right to construct Velma Road and the Court may so find this fact. 21. Construction of Velma Road is necessary to residential development and will require removal of a portion of the retaining walls and a disruption of some grass, shrubs and a few trees within that portion of Velma Road abutting Plaintiffs' property. 22. This action was instituted by the Plaintiffs after Defendant negotiated with the Town of Wakefield regarding the removal of a tree within the right of way of Velma Road for the purpose of constructing Velma Road. At the trial which was held on August 10, 1990 at which a stenographer was appointed to record and transcribe the testimony, the parties called no witnesses and rested on the stipulation which has been set forth above and the exhibits which are incorporated herein for the purpose of any appeal. I find and rule as the parties have agreed. The law of this Commonwealth is well-settled as to rights in ways, even those which have been long dormant and where the parties only recently have sought to have their rights determined. I recently have decided two Land Court cases which dealt with this problem, one Launsby et al v. DeLorenzo et al, Miscellaneous Case No. 129141 and the other, Shalhoub et al v. Cheriton Grove Corporation et al, Miscellaneous Case No. 122924. The general rule is that an easement created by grant continues in existence unless such right has been lost by an express grant, release, estoppel, abandonment or by the acquisition by others of the fee free of use therein through the exercise of prescription or adverse possession. See G.L. c. 187, §5, Nantucket Conservation Foundation, Inc. v. Russell Management, Inc., 380 Mass. 212 (1980). The mere nonuser is insufficient to terminate the rights in a way, Lemieux v. Rex Finishing Corp., 7 Mass. App. Ct. 417 (1979), and the burden rests on the owners of the servient estate to establish abandonment by the owners of the dominant tenement. The adverse us by the owner of the servient estate inconsistent with the continuance of the easement, if continued at least for a period of twenty years, may terminate the rights within the way, see Desotell v. Szczygiel, 338 Mass. 153 , 158 (1958). The instrument granting to the predecessors in title of Mrs. Lanzillo a right to use the then traveled path to the street provided that an easement would be granted, as appurtenant to what is now Lot A, to use the way which was to be created adjacent to Lot A. So far as appears, however, a formal easement never was given by the Burkes, but I rule that there is appurtenant to Lot A the right to use Velma Road for all purposes as was intended by the parties, therefore I interpret her appurtenant right in the same manner as of those of the other parties. They all have a right to use the way for all purposes which includes the right to install utilities in the way. The question of the fee as between the plaintiffs is not an issue in this case, and I do not reach it. The real decisive and divisive issue is the right of the defendant to construct a way within the limits of Velma Road as shown on Exhibit No. 6. Absent the presence of the easterly stone wall which is clearly located withn the way there could be no serious question about the defendant's right to do so. It is arguable that the maintenance of the wall for nearly forty years cuts off any rights in the defendant to remove it. The stone wall, however, appears to have been in place at the time the rights in the way were created and to have remained	there during	the intervening years. I find and rule that the failure to remove the wall constituted nonaction by the various parties and was not a conscious attempt by any of the plaintiffs to block rights therein. I further find and rule that the defendant's rights in Velma Road have not been lost by release, estoppel, abandonment or adverse use. This being so, it is well-settled that the owner of the dominant tenement has the right to improve the way and even to change the grade thereof, if necessary, so long as such actions are not unreasonable and have due regard to the rights of others. Guillet v. Livernois, 297 Mass. 337 (1937). It follows that the defendant may remove any trees situated within the line of the way and may install therein necessary water pipes and sewer pipes together with their appurtenances. So far as the stone wall closest to the Lanzillo premises is concerned it can be removed from the way and relocated at the Lanzillo property line. It is too handsome a structure to be simply demolished. The exhibits reveal that this is an asset to the neighborhood, and it should not be destroyed. The stone wall adjacent to the McGee premises is situated on land owned by Ms. Regis and Mr. McGee and thus will not be affected by improvements in the way. [Note 1] Ernest J. Lanzillo died January 8, 1990; he and his wife held title jointly to the property shown as Lot "A" on a plan entitled "Plan of Lot in Wakefield Mass. for J. William Burke" dated March 15, 1951 by Dana F. Perkins and Sons, Inc. recorded as Plan No. 332 of 1951 with Middlesex South District Registry of Deeds, Book 7717, Page 555, so the joining of additional parties is unnecessary.